A Better Way to Learn. A Better way to Share. We think smart ideas should travel faster. Our features are designed with that in mind. We want to make orthodontic learning intuitive and trustworthy, so our patients around the world can benefit. 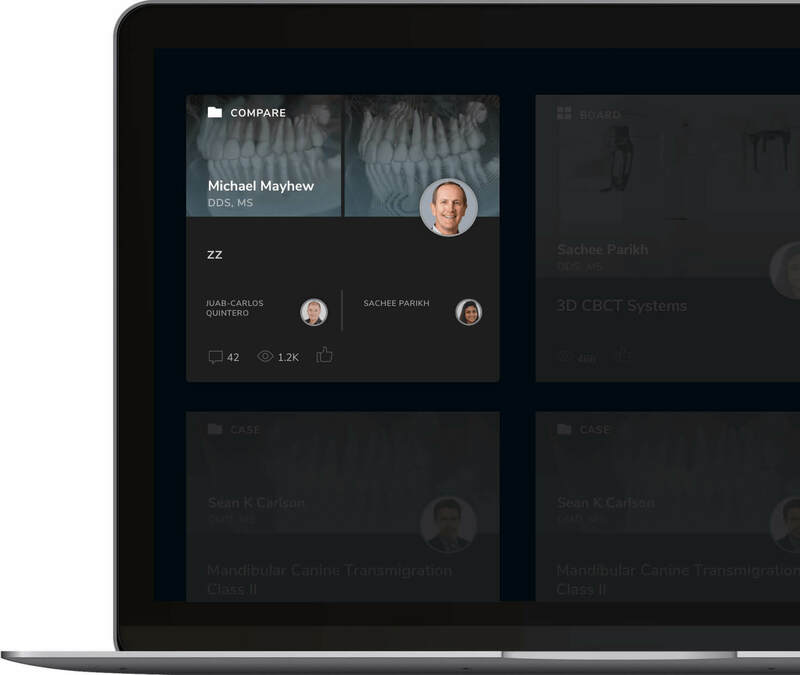 Our revolutionary CaseCard™ technology transforms complex treatment information into simple visuals, allowing doctors to learn from each other quickly, from anywhere in the world, on any device. We love simple, and we love details. So we’ve designed our CaseCards to have a simple interface with tremendous depth. Whether you’re learning from our stunning image displays, or you’re examining the specifics of each appliance used, we deliver. We’ve even included details like wire size, timing details, and elastic wear. Never before have orthodontists had access to such detailed case information from so many sources. We’re spanning the globe to collect detailed 3D treatment information on thousands of treated cases from all types of orthodontists, using all types of appliances and techniques. Learning from each other has never been this easy, or this organized. Let us help you find the simple. Every CaseCard in our database is painstakingly tagged and searchable. We’ve done the homework, so you don’t have to. You can simply get to what you need quickly. So whether you’re searching by doctor, case type, or appliance type, we’ll be sure to get you there fast. And once you arrive, you’ll be treated to the most comprehensive (and intuitive) case display you’ve ever experienced. We know doctors love learning. Let us help you discover new techniques that enhance your practice. Since each one of our CaseCards is meticulously tagged, when you find a case that’s interesting, we instantly connect you with related cases. It’s like having your own customized orthodontic scout — someone constantly presenting you with new alternatives and techniques. Build your own deck of CaseCards. Whether that consists of your own cases, those treated by trusted colleagues, or a combination of both, we’ll keep you organized with our Boards. No more searching your hard drive for that great case you once presented. It’s always easy to find on OrthoScience. 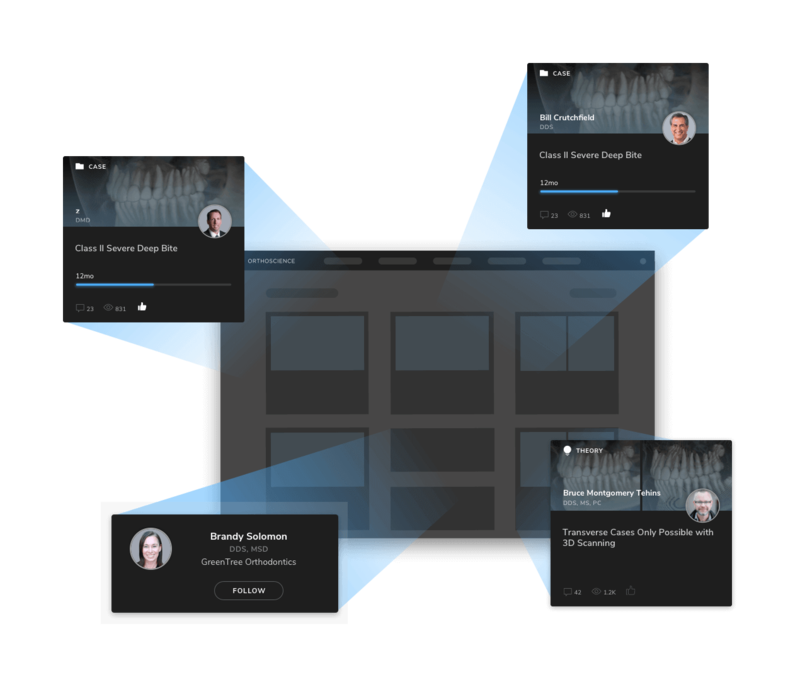 And with presentation-ready visuals already built in, your next presentation just created itself. Analyzing two cases side-by-side can be mind-blowing. It will forever change the way you evaluate your treatment. Whether you chose to study your own work or the work of your trusted colleagues, once you’ve used our case comparison tools, you’ll never want to go back. You may even stumble upon a new clinical observation that helps take our specialty to the next level. And now there’s an easy way to share that idea. Post your observation by creating a Compare Card, and help the rest of us grow. View different treatment approaches, from all types of doctors, philosophies, and appliances, side-by-side. Understand how new techniques and technologies work, before you modify your own. Incorporating a new appliance into a busy orthodontic practice can be stressful. Once we’ve discovered a new appliance, we often have questions that need to be answered before we feel comfortable bringing it on board. And we often turn to our colleagues for help. Usually, the goal is to emulate what we’ve seen being done by a trusted colleague. Studying the details of successful case work gives us so many answers. If you want to know how a new appliance compares with what you’re already doing, simply compare cases side by side. Down to the details. And because our experience is visual, you get a ton of answers quickly. Understand treatment differences like never before, in a fraction of the time. Across healthcare, the standards of Board Certification were originally developed with the intention of helping practitioners become better at their craft. And the standards were always changing. Always improving. Of course, this is a necessary and noble cause. Yet all of us have our own methods of becoming better at what we do. And the world is moving faster than ever. So keeping our standards current is becoming more and more difficult. But through it all, one thing remains clear, we must study our work in order to improve. OrthoScience makes studying easy. Welcome to your own personal classroom. Do you think functional appliances achieve superior Class II correction when compared to elastics? Or does it all come down the wires that you use? OrthoScience believes ideas that help move our specialty forward should be published quickly. And we believe theories should live alongside their supporting source data. Do you have a theory of why one Class II corrector works better in your hands than another? Share it. Instantly. Do you have an opinion that you’ve been wanting to share with your colleagues? Share it. Instantly. Sometimes, ideas need to be expressed in the moment. In today’s high-speed world, waiting in the queue of your favorite journal’s publication process might render your idea untimely by publication time. OrthoScience provides a space where both peer-reviewed work and well-crafted essays can live in harmony. We think good ideas should travel fast, especially when they’re backed by evidence. And bad ideas, well, they need a place where evidence quickly puts them in their right place. As our data grows, so too grows the knowledge of our users. Orthodontic research will never be the same. Evidence-based practice is something that we all strive for. Achieving it is fraught with challenges. Research papers offer some help, but averages and p-values rarely apply to what you are doing in your practice. You always need to adjust findings to fit your techniques and your appliances. We’ve made this easy. Imagine reading a research paper where you can drill down into the sample and study the details of each individual case. Imagine that paper’s ‘Discussion’ section being open for live debate. Orthodontic research just hit light-speed! Orthodontists are smart. We have a lot of good ideas. Finding a HIPAA-compliant platform to share those ideas can be difficult. Especially when your idea contains sensitive patient information. We make sharing clinical ideas easy. 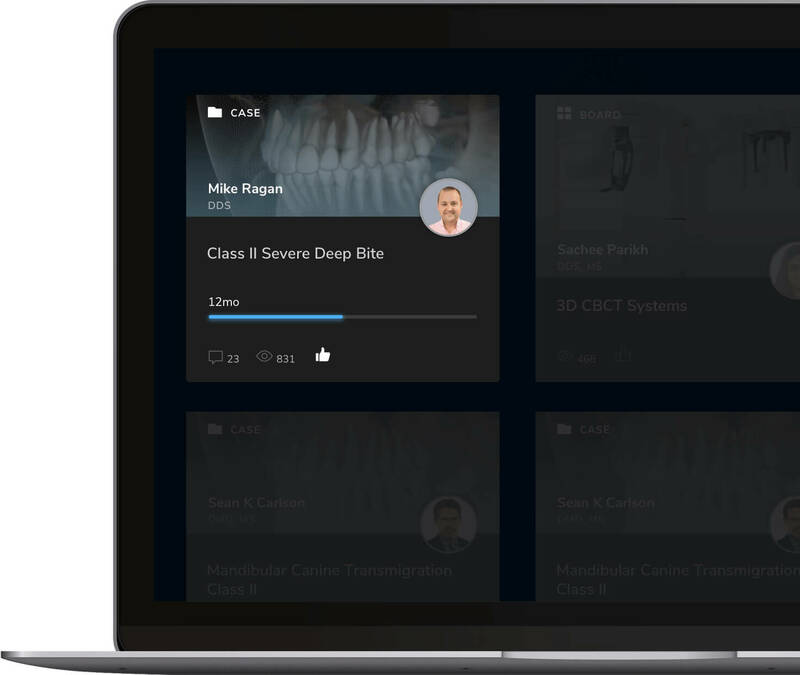 Whether you want to share a simple clinical pearl or share the treatment details of an entire case, we’ve got you covered. And because statements and comments can now be backed-up with actual case work, the days of “armchair quarterbacks” offering distracting treatment advise may be numbered. Plus, it is fragmented across the internet and that can be impossible to search. Why can’t I find all my favorite orthodontic Blogs be in one place? And why can’t I organize them and search them by topic? Well, now you can. We’re working with the top content creators in all of orthodontics to give their fans a place to organize and share everything that they love. Organize your orthodontic world. Everything in our database is tagged and searchable. We mean everything — cases, appliances, doctors, equipment, even ideas and theories. That means it’s easy to personalize your orthodontic world. We’ve developed an intuitive organization solution we call Boards. Save all of your favorite Class II cases to your own personalized Board. Create one Board or thousands! And yes, those are searchable too. Of course, our flexibility allows you to keep your Boards private. But sharing your Boards with the world allows others to grow as well. Share your best teaching cases with the ortho residents of your alma mater. Or share your list of favorite Class II correctors with your new associate. Or maybe share a mixed collection of doctors, cases, appliances, and equipment — everything you use in your single or multi-practice enterprise. The uses of Boards are endless. We know you’ll find great ways to organize your entire orthodontic life. Think of your Boards as your own set of customizable folders for everything you find interesting on OrthoScience. And our database will be massive. We plan to cover your entire orthodontic world. So toss anything onto a Board that you’d like — a group of doctors, your favorite appliances, your favorite cases — anything! Name your Board and tag your Board however you see fit. This is your place to play. Orthodontists are smart. We have a lot of good ideas. We are also organized. Our practices are built on great organization skills. Combining great ideas and great organization is what Boards are all about. The best part is that once you’ve organized your Board, you can share it with the world! Maybe you’ll choose to share a Board that contains your favorite cases from 2018. But we know that sometimes privacy is best. You might choose to keep your Boards private, or choose to share them with a select group. The choice is yours. Organize your stuff your way. Anything goes. We realize organization is different for everyone. A quick peek inside the cabinets of your best friend’s orthodontic practice will make our point. And we love diversity. We think you should be a able to do things your way. Our Boards let your imagination run wild. Maybe you’ll make a Board that contains every orthodontic meeting you’ve attended. Maybe you’ll create a Board containing all of your favorite TAD cases. The options are endless. We think you’ll love it! Staying connected helps doctors grow. But sharing detailed case information can be tricky. Plus, finding a platform that is both HIPAA-compliant and well-organized can be a challenge. Look no further. OrthoScience has been meticulously designed with the busy orthodontist in mind. We know you need quick access to doctors in your network of trusted colleagues. We know you need contact information that stays updated. We know you need the ability to customize your messaging groups — whether it’s a chat with one colleague, or a whole group. 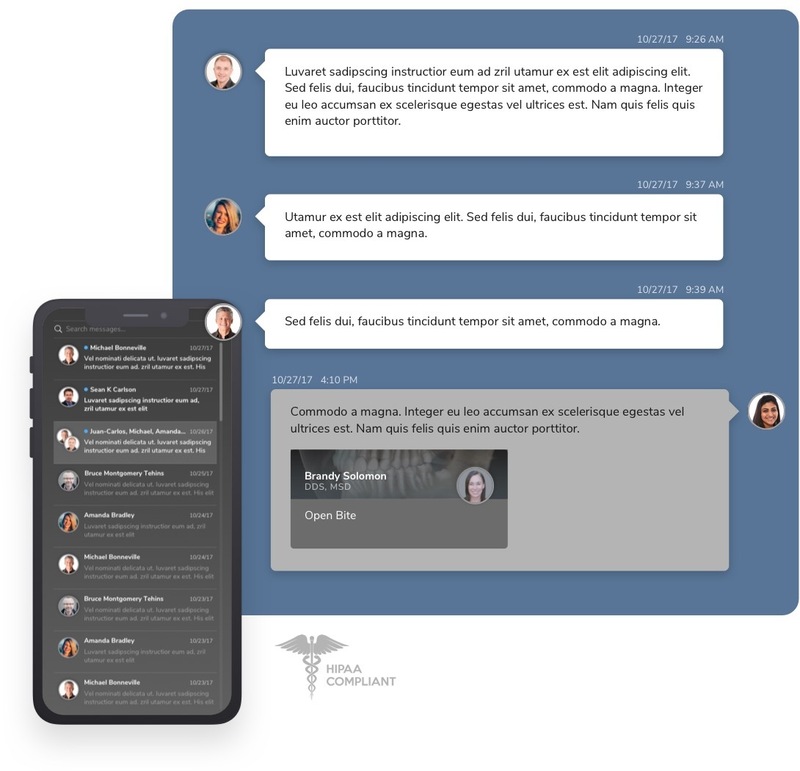 Plus, easy access to our well-organized database allows our users to communicate case information effectively (and safely) with their colleagues. So, if you’re a doctor looking to bring your healthcare communication into the 21st century, OrthoScience has you covered. 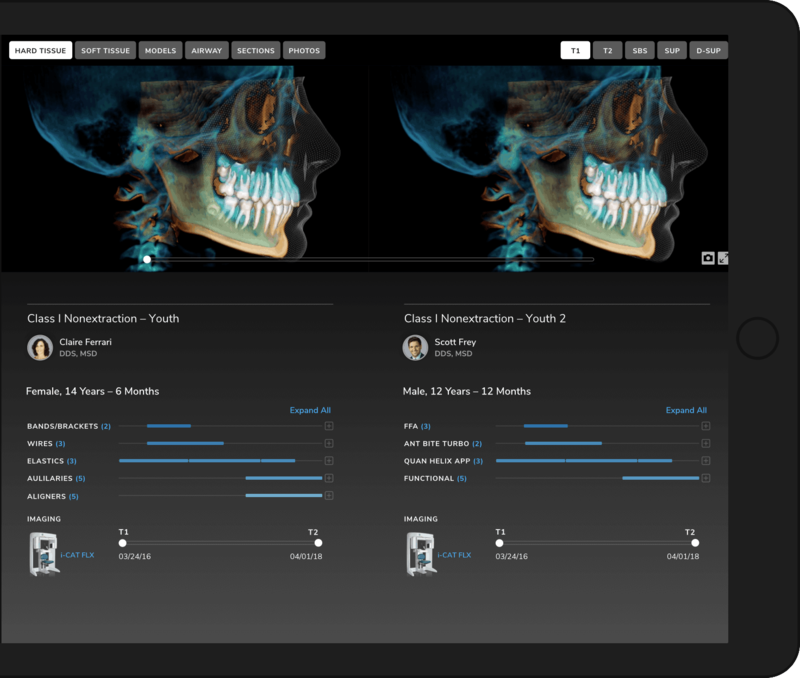 All of our users on OrthoScience are orthodontists. How can we be sure? Because we verify every last one of them. Yes, that’s right, we verify. Our secure sign-up system ensures that our OrthoScience community is made up of orthodontists and nothing more. We think the comfort of knowing that you’re in a “room” with your colleagues will help fuel honest discussion. We take pride in assuring our users that they’ve built a strong digital community that they can trust. Our Doctor Cards keep your network well-organized and updated. We realize everyone has a contacts app. We know that many doctors also chose LinkedIn or Facebook to stay in touch. But things can get confusing when you want instant access to a filtered list of just your orthodontic colleagues. And what if you want to organize them by ‘Study Club’, or ‘Alma Mater’? We give you unparalleled control of your contacts. You’ll never reach for your AAO directory again. As our orthodontic world becomes more and more digital, sharing your ideas and your thoughts has never been easier. But sometimes conversations need to be private. We respect that. We believe in privacy. Sometimes you need to talk one-on-one. Sometimes you need to share with a select group. We make communication easy. And we help keep it organized. So, if you ever need access to all the cases your private study group has ever discussed, we can give it to you.